Book your Saturday day pass right here – right NOW! Sasquatch! 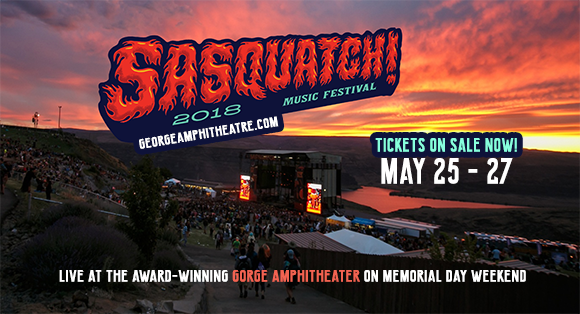 is back for yet another incredible year at the annual host, Gorge Amphitheatre. In it's stunning surroundings fans will gather to catch the latest live acts on the stage. Are you ready?! As it celebrates it's 17th year, the team at Sasquatch have been sure to collect feedback from it's fans on any improvements and exciting changes/updates to the weekend to ensure the best festival experience for all. The 2018 lineup aims to please and will be packed of the best artists, continuing the same spirit the festival has always had since it's beginning! Along with these adjustments, the crew have also been working on a few new areas including a craft beer village! The Gorge Amphitheatre is situated Columbia River located at 754 Silica Rd, George, Washington – The Sasquatch! family will see you there!